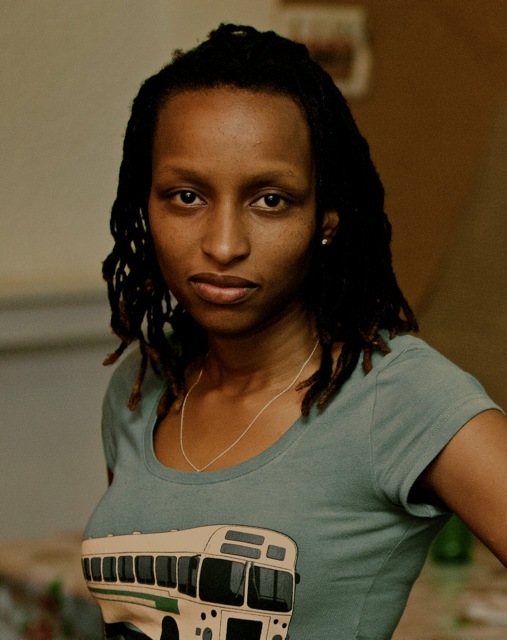 Born and raised in Kenya, Wambui Kamiru has been developing artwork around the theme of colonialism, identity and independence in Africa. “Tree” was part of the group show “Forecast” that brought together Jackie Karuti, Gor Soudan and Wambui Kamiru at the Goethe Institute Nairobi (2015). “Tree” was about the imagination of a tree by someone who had never seen a tree but had been given the definition from memory by someone who once knew what a tree was. It was part of the conversation around climate change and our individual responsibility towards leaving a healthy planet for future generations. “I Move Out. Tomorrow.” was a departure from the political as Wambui explored the personal space occupied by love and the loss of love. It opened March 2015 at Circle Art Gallery as part of the group exhibition, “Concerning the Internal.” Over the course of a month, the installation used social media #IMOTomorrow to share the notes written by the audience who came through the installation. “Your Name Betrays You” (#YourNameBetraysYou) opened at Kuona Trust in February 2015, explored the origin of ethnicity using current literature on the invention of culture and tradition. Key texts point at tradition as a purposely-created classification of Africans by missionaries and colonial administrations, much in the same way that a guidebook would be written for birds. The exhibition looked critically at the words/stereotypes we hold of the “other” – root, development and how we have made it a part of our lives. It also looked at the effect on our future society and created dialogue around our present perceptions of ethnicism. Wambui is currently working with another artist, Xavier Verhoest on a national public art project/installation, “Who I Am, Who We Are” about the Kenyan identity and ideas of nationalism, present and future. “Who I Am, Who We Are” is a project about the idea of nationhood and how this is embodied through the Kenyan sense of identity and everyday interactions. It is a concept animated by the notion that today’s world reflects a reality both multiple and unique. Nowhere is this idea truer than here, in Kenya, at 50. The project has travelled through Nairobi, to Kisumu, Lamu, Nyeri and Isiolo. In 2013, Wambui held an experiential installation on Panafricanism, “Harambee63” at Kuona Trust, Nairobi, where her studio was based. It was also shown at the University of Wits in South Africa in 2014 and at the Kenya National Museum in 2015. “Harambee63” places the period of independence, specifically 1960 – 1963 as a key marker of the global movement against the oppression of Black and Coloured people. The installation demonstrates that the struggle for freedom was universal and cyclical. It raises questions about whom we consider revolutionaries touching on Africa’s vast history (1884 – 1963) from Gandhi and Shaka to modern day “heroes” political or non-political. Outreach projects that Wambui has been involved in include the Pumwani Art Project: A Beautiful Delivery which brought contemporary art to the hospital walls of East Africa’s largest maternity hospital.